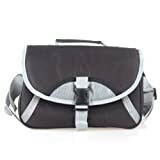 A sturdy and convenient camera bag with tough interior padding that was specifically designed to fully protect your Digital Cameras anywhere you go! This entry was posted in Discount Photography and tagged Camera, Cameras, Canon, Case, Digital, DSLR, Fujifilm, More, Neewer, Nikon, Olympus, Sony by Ball Photo. Bookmark the permalink.